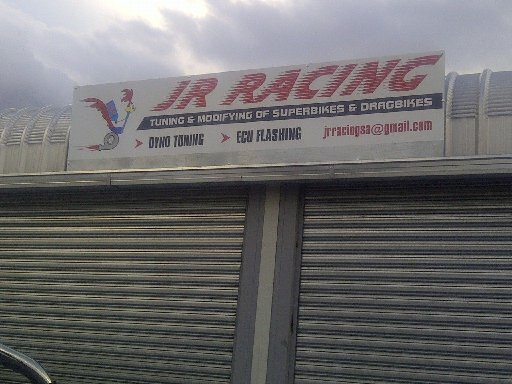 JR Racing is two guys with a passion for bikes and bike racing. Building and maintaining super-bikes and drag bikes, we have had a few successful top speed bikes built of late a normally aspirated Generation II Suzuki Hayabusa with only head gas-flowed, race cams fitted and fuelling and timing adjusted inside the ECU reaching a top speed of 328km/h at the Wesselsbron Top speed Event. 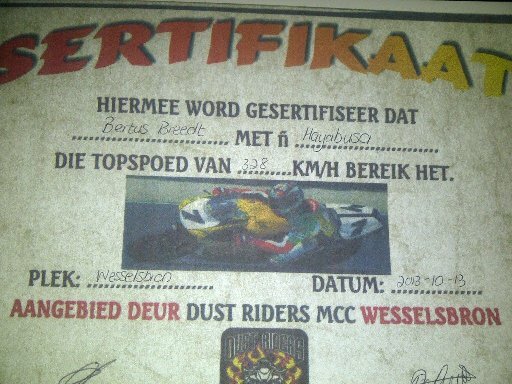 Certificate attached. ECU Tuning is done by means of the Woolich Racing products whereby no piggyback fuelling or ignition system is fitted (money saving) and all modifications are done within the ECU. JR Racing are the official SA distributor/re-seller of the Woolich Racing Tuning products and stock is always readily available from us. We have a Dyno on site and can give a "before" and "after" reading with explanation of what has been done to your bike. We also prepare motors and bikes for both Nitrous Oxide conversions and/or Turbo applications.